APPSC Degree Lecturers Recruitment Hall tickets, Exam Dates 2017 | psc.ap.gov.in: APPSC Degree College Lecturer Posts Recruitment Notification 2017 . Apply online for 504 DL Jobs. 504 Lecturers Posts recruitment by APPSC, APPSC Degree College Lecturers Recruitment 2017 notification. APPSC Notification for Degree College Lecturers Posts published on 29th December 2016. Andhra Pradesh Public Service Commission has published the Degree College Lecturers Recruitment 2017 notification to fill 504 Vacancies in Government Degree Colleges In A.P. Collegiate Education Service and applications are invited online from qualified candidates to the post of Degree College Lecturers in Govt Degree Colleges in the State of Andhra Pradesh. The proforma Application will be available on Commission’s Website (www.psc.ap.gov.in) from 29/12/2016 to 28/01/2017 (Note.17/02/2017 is the last date for payment of fee up- to 11:59 mid night). APPSC Degree College Lecturer Posts Recruitment online applications, how to apply, eligibility criteria, fee, selection process, scheme of examination, hall tickets details are given here. All desirous and eligible applicants shall apply ON-LINE after satisfying themselves that they are eligible as per the terms and conditions of this recruitment notification. PC. No. Name of the Subject Z-1 Z-2 Z-3 Z-4 Total Vacancies Age as on 01/07/2016 Min – Max. Scale of Pay Rs. Applicants must possess the qualifications from a recognized University as detailed below or equivalent thereto, subject to various specifications in the relevant service rules and as per the indent received from the Department as on the date of notification. i) Good academic record with a minimum of 55% marks or an equivalent Grade of B in the 7 point scale with letter grades O, A, B, C, D, E & F at the Masters Degree level, in the relevant subject, obtained from the Universities recognized in India. ii) Should have passed National Eligibility Test (NET) for lecturers conducted by UGC, CSIR or similar tests accredited by the UGC or SLET conducted by the Osmania University in terms of G.O. Ms. No. 19, Higher Education (CE-1-I), Dept., Dt. 24/02/2011 and by Andhra University, Visakhapatnam in terms of G.O.Ms. No.47, Higher Education (CE-1)Dept., dt.02/12/2015. 1. A relaxation of 5% marks may be provided, from (55% to 50% of marks) at the Master’s Level for the SC/ST/PH category. 2. A relaxation of 5% marks may be provided, (from 55% to 50% of marks) to the Ph.D., Degree holders who have passed their Master’s Degree prior to 19.09.1991. 3. “NET/SLET shall remain the minimum eligibility condition for recruitment and appointment of Lecturers in Government Degree Colleges”. AGE: No person shall be eligible for direct recruitment if he/she is less than 18 years of age and if he/she is more than 42 years of age as on 01/07/2016. i) The Fee mentioned in the above paragraph is to be paid online using Payment Gateway using Net Banking/ Credit card / Debit Card. The list of Banks providing service for the purpose of online remittance of Fee will be available on the Website. ii) The fee once remitted shall not be refunded or adjusted under any circumstances. Failure to pay the examination fee and application fee (in non-exempt case) will entail total rejection of application. I STEP: The applicant has to fill the OTPR application to obtain ID Number. While filling the same, the candidates have to ensure that there are no mistakes in it. The Commission bears no responsibility for the mistakes, if any, made by the candidates. Notification Number and Name, OTPR ID Number and Date of Birth to proceed further. Applicant has to verify the details as obtained from OTPR database displayed on the screen. If any details are to be changed, applicant should go back to the website and use the Modify OTPR link. In addition to the details obtained from OTPR database, Notification specific details such as Examination City opted, eligibility and accepting declarations etc. are to be filled by the applicant. (Preview and Edit facility is available to make changes) and SUBMIT the application form. An Application Fee ID is generated and sent through the SMS/email after successful submission of application form, which is to be used for payment of Fee. III STEP:- Once the Application Fee ID is generated, select the payment of Fee option for paying through either Net banking / Credit Card / Debit Card. IV STEP:-After payment of fee, the PDF Application will be generated which contains the particulars furnished by the applicant. The Application Fee ID No in the PDF Application form has to be quoted for future reference/correspondence. • Applicant shall note that, the details available with OTPR database at the time of submitting the application will be considered for the purpose of this notification. If, any changes are made by the applicant to OTPR database at a later date will not be considered for the purpose of this Notification. • Hand written/ Typed/ Photostat copies/ outside printed Application Form will not be accepted and liable for rejection. Syllabus, Scheme of exam, Qualifications, selection procedure, How to apply, how to fill the online application form, Written exam date, Application fee, hall tickets, results declaration date, selection list preparation method, instructions to the candidates and more details are available at Detailed Notification. The Examination will be held at Vijayawada or Guntur only. However the Commission reserves the right to allot the applicant to any centre, duly creating a new center for administrative reasons of examination depending on the availability of the resources like centres / systems. 1. Submission of Online application: 29/12/2016. 3. Date of Examination: The Commission conducts Screening test in Off - Line mode in case applicants exceed 25,000 in number and main examination in On-Line mode for candidates selected in screening test. If the screening test is to be held, the date of screening test will be communicated through Commission’s Website. The Main Examination is likely to be held On-Line through computer based test on 06/06/2017 FN & AN. 1. In continuation of the Corrigendum dated.07/02/2017, it is clarified that, the present selection is only for posts in Political Science and both candidates with M.A (Political Science) & M.A (Public Administration) would write examination in Political Science only, if they are otherwise eligible. 2. It is also clarified that candidates with MCA at PG level and B.Sc. (Computers) at UG level are eligible for the posts of Lecturers in Computer Science and they can apply, provided they are otherwise eligible as per Commission's Notification No. 26/2016 and they would have to appear in Computer Science paper. 3. With regard to equivalence to M. Tech (Computers), the courses with nomenclature mentioned in AICTE approval process hand book 2017-18 from SI. No.99 to 121 are treated as equivalent as clarified by the Unit Officer. 4. In light of the above, the last date for submission of applications is extended by three more days up to 17/02/2017. Above exam schedule for Lecturers in Govt., Degree Colleges Notification No.26/2016; Note: No Examination will be conducted for Subjects of Lecturers in Oriya, Urdu and Geology as no eligible candidates have applied for these posts. APPSC Degree College Lecturers Exam Hall tickets released and Download it now form psc.gov.in web portal: The Downloading of Hall Tickets of APPSC Degree College Lecturers Exam (Notification No :26/2016) scheduled to be held from June 6, 2017 to June 8, 2017 is started. 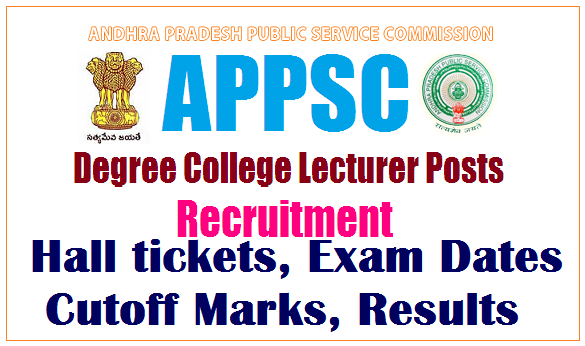 The candidates who have applied for the recruitment of Degree College Lecturers of Andhra Pradesh Public Service Commission (APPSC) can go to the official website and download their hall tickets/admit cards now. Hence the downloading has been started, APPPC said that the requisitions to change of centers will not be entertained from the candidates now on wards. The Andhra Pradesh Public Service Commission (APSC) had earlier invited applications for lecturers in the following departments of various colleges in the state: English, Telugu, Hindi, Urdu, Oriya, Commerce, Economics, History, Political Science, Mathematics, Physics, Chemistry, Botany, Zoology, Statistics, Bio-Technology, Micro-Biology, Computer Applications, Computer Science and Geology. The selection process for recruitment to the post of degree college lecturers in government degree colleges includes a written examination and an Interview or oral test. Paper-1: General Studies & Mental Ability: There will be 150 objective type questions in session for 150 marks. Paper-2: Concerned Subject: Only one subject will be considered for this test with 150 questions for 300 marks. The maximum marks for the interview is 50. Total marks for the written examination and the interview will be 500. Web note: The Generation of Hall Tickets for Degree College Lectures Exam (Notification No: 26/2016) scheduled to be held from 06-06-2017 to 08-06-2017 is already started. Hence, the Requisitions to change of centers will not be entertained from the candidates.